Carl Sagan was captivated by the notion of life beyond Earth. 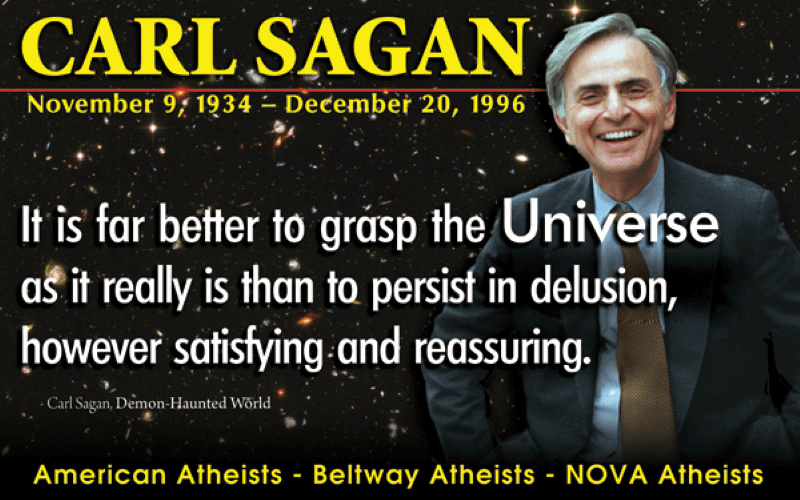 Nevertheless, in this interview conducted shortly before the famous champion of science died in 1996, Sagan says that extraterrestrial intelligence is a “wonderful prospect, but requires the most severe and rigorous standards of evidence.” Sayang doubt that supporters of different so called “an alien abduction”, making headlines in the 1990s met those scientific standards. Question Asked: Speculate for a moment on the part of human nature, common belief in abductions, or aliens, in any case, and of human nature that wants to seek other forms of life in the universe. Carl Sagan: I personally have been captured by the notion of extraterrestrial life, and especially extraterrestrial intelligence, from childhood. It swept me up, and I’ve been involved in sending space craft to nearby planets to look for life and in the radio search for extraterrestrial intelligence. It would be an absolutely transforming event in human history. But, the stakes are so high on whether it’s true or false that we must demand the more rigorous standards of evidence—precisely because it’s so exciting. That’s the circumstance in which our hopes may dominate our skeptical scrutiny of the data. So, we have to be very careful. There have been a few instances in the [past]. We thought we found something, and it always turned out to be explicable. It seems to me there is a big difference between the two approaches to extraterrestrial intelligence, although I’m frequently written to [to] say how could I search for extraterrestrial intelligence and disbelieve that we’re being visited. I don’t see any contradiction at all. It’s a wonderful prospect, but requires the most severe and rigorous standards of evidence. Carl Sagan: Well, it’s almost entirely anecdote. Someone says something happened to them, and people can say anything. The fact that someone says something doesn’t mean it’s true. Doesn’t mean they’re lying, but it doesn’t mean it’s true. To be taken seriously, you need physical evidence that can be examined at leisure by skeptical scientists: a scraping of the whole ship, and the discovery that it contains isotopic ratios that aren’t present on Earth, chemical elements from the so-called island of stability, very heavy elements that don’t exist on Earth. Or material of absolutely bizarre properties of many sorts—electrical conductivity or ductility. There are many things like that that would instantly give serious credence to an account. But there’s no scrapings, no interior photographs, no filched page from the captain’s log book. All there are are stories. There are instances of disturbed soil, but I can disturb soil with a shovel. There are instances of people claiming to flash lights at UFOs and the UFOs flash back. But, pilots of airplanes can also flash back, especially if they think it would be a good joke to play on the UFO enthusiast. So, that does not constitute good evidence. A very interesting example of this sort of thing is the so-called crop circles in England in which wheat and rye and other grains—these beautiful immense circles appeared and then—this was in the ’70s and ’80s—and then over progressive years, more and more complex geometries. And there were lots of people who said that these were made by UFOs that were landing and that it was too complex or too highly mathematical to be a hoax. another one which contradicted that hypothesis. And they were very pleased when it was said that no human intelligence could do this. That gave them great satisfaction. And for 15 years, they succeeded in these nocturnal expeditions using rope and board—all the technology they needed. And in their 60’s, they finally confessed to the press with a demonstration of how it was done. And, of course, the confession received very little play in the media. And the claims of alien influence had received prominent exposure.